With units of the HTC First collecting dust inside AT&T warehouses, it is no surprise that a number of other smartphone manufacturers have no interest in developing an Android model with the Facebook launcher pre-installed. The HTC First, the first handset to come with Facebook Home installed out of the box was released with a price tag of $99.99 on contract. That price has been cut by a massive 99% to 99 cents and even at that price, there doesn't appear to be any takers. The HTC First was also supposed to touchdown in the U.K., a trip that has been since canceled. According to Industry sources, Facebook did a smart thing and approached top Android smartphone OEM Samsung about developing a Facebook Home powered model. Some might say that the Korean based tech titan did the smarter thing and turned Facebook down. But these sources say that some Android manufacturers haven't totally rejected the idea of putting together a Facebook Home supported model. Most likely these firms are waiting to see if Facebook improves the functionality of the launcher. Meanwhile, OEMs like HTC, Sony and Huawei are said to be more interested in improving their own home screen and UI. "Smartphone manufacturers not interested in Facebook Home" So are the smartphone users. That's actually a 99% cut, not 90%. Just give up Mr. Zuckerberg! Nobody wants Facebook phone! Such a shame. The Hardware for the HTC First is quite good for a midranger. And considering once the Facebook home is turned off that it runs vanilla Android, it really should be doing a lot better. ...the AT&T salesman at the big AT&T mall store told me that they literally had not sold 1 unit of this f(akebook) Branded POS...Why would anyone actually PAY to advertise for that low-life? Well that's reassuring. Who the hell wants FB phone anyway? No one wants FB too see what you're doing. 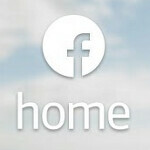 It's not smartphone manufacturers are not interested in Facebook Home. It is consumers are not interested in Facebook Home. Just look at the rating on Google Play. It is a 2.5 star average and the majority of people gave it only 1 star. I would highly dispute the "35 and under crowd". Probably closer to 20 and under that use FB constantly. What Zuckerberg, FB and its shareholders don't grasp is that the popularity of Facebook is in spite of its creepiness, not because of it. My friends and family and I use Facebook because it's the most convenient way to stay in touch with the friends and family that we don't normally call or text. We don't like it, we just use it. haha.... c google.. u didn't have anything to worry about it.